these adorable sundresses are perfect for summer! As a beach cover up, or your night on the town dress, perfect! Choose from 5 different colors and styles. For a limited time you get free shipping! Please kindly tell me what color you'd like at checkout or in paypal note. 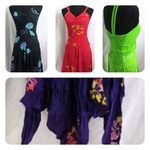 Hankerchief Sundress, Angle cut sundress asymmetrical dresses with smocked back and non-adjustable spaghetti straps. 100% Rayon, handmade in Bali Indonesia. "One size fits all" - Will fits US Size 6, 8, 10. Length size: 40 to 43 inches long.